Size: 6.1" x 3.1" x 1.5"
This EC-425 distributed by Radio Shack (A Tandy corporation company) could be easily identified as a restyled SR-10. The mold of the housing looks very similar to other restyled Wedge area calculators like the Montgomery Ward P200. Dismantling this Radio Shack EC-425 manufactured in October 1974 reveals indeed the printed circuit board (PCB) of the SR-10. It makes use of the TMS0120 single-chip calculator circuit derived from the TMS1802, better known as first "calculator-on-a-chip". The remaining components found inside an early SR-10 are known from the Datamath, too. Two display-drivers each for the segments and digits of the LED-modules and a discrete power converter to generate the three different supplies inside the calculator. 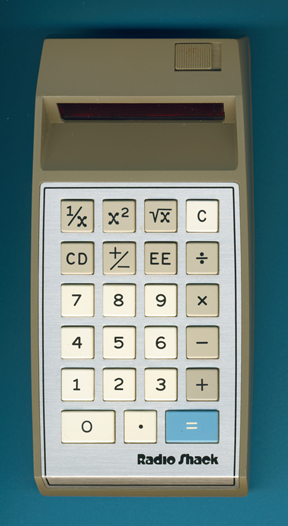 The LED display vary from calculator to calculator, this one uses a Bowmar Optostic.